Theatre is one of my favourite things. However, I did not have the opportunity to experience it until I was a teenager. To share our love of theatre, this past weekend, Rick and I took our granddaughter, Sylvie, to see Alice Through The Looking Glass at the Confederation Centre in Charlottetown, Prince Edward Island. It is a beautiful theatre and its size was not lost on Sylvie who had only experienced the Harbourfront Theatre in Summerside prior to that day. The play itself was well done, with beautiful costumes, great acting and wonderful props. For Rick and I however, the experience was not about the performance itself but seeing our grandchild experience a theatrical production for the first time. 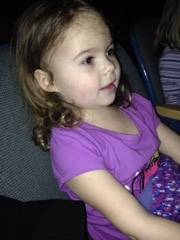 Sylvie loved everything about the performance, the jelly beans, bubbles, streamers, characters, music, and dancing. She especially loved Alice who worked her way through a chess game, meeting and overcoming all obstacles she met along the way. Sylvie loved Humpty Dumpty as well and was sad when he fell off-stage and egg splattered on to the stage. She enjoyed watching the conductor in the orchestra pit and listening for the unseen musicians. As I sat with Sylvie, I thought of my grandfather Pretty who took me traveling with him. Though I was older than Sylvie, I experienced so many new things traveling with Pop and I was enthusiastic about everything. I wonder if he took the same pleasure in watching my experience of the world like we enjoyed Sylvie's reaction to the play? Sylvie is the fifth generation from my grandfather Pretty. I hope she has fond memories of her grandfather and me in years to come, just as I have of my grandfather. We have a good beginning. 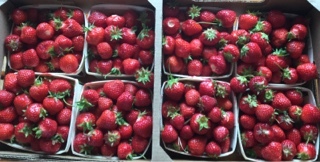 It is that time of year again when Prince Edward Island strawberries are ripe. They are such a luscious treat that it is impossible to pass them at the store. The local berries are so good, naturally sweet and tasty. Driving home with them in the back seat fills the car with that fresh strawberry smell. There is jam and shortcake in our future. 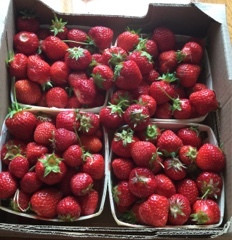 In Mount Pearl, Newfoundland where I grew up, our next door neighbours, the Ralphs, grew delicious strawberries as well. They worked hard to augment the soil, using seaweed, to make fertile soil for fruit and vegetables to grow. 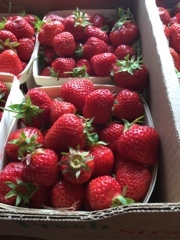 Their strawberries were also tasty and juicy, used for jam which Mr. Ralph ate every day. Every year, the Ralphs gave us some strawberries and we often ate them right out of the garden. One year, Dad ate strawberries and had to go to hospital because of an ulcer which started to bleed due to the acid in the berries. Before long he had surgery which removed two thirds of his stomach. Today people take antibiotics for the same problem. Poor Dad! He never ate strawberries again. I love them but always remember what happened to Dad. Strawberries, delicious as they are, can stir up a variety of memories. Thursday March 30th, we visited the Goose Bay airport and around town. 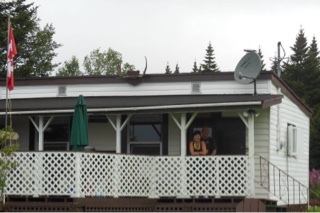 While in Goose Bay we stayed with Baxter McKay and his wife Kaye, they were very nice people. 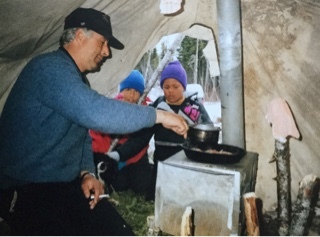 We also met with Lee Parsons over a caribou supper cooked Labrador style, it was a wonderful meal. Friday March 31st, we brought the snowmobiles to the garage to be checked. We were very busy that day picking up the food, gasoline and other supplies at we would need for the trip back. That night Clayton and I met with Henry Rich and his wife to exchange stories, before the evening was over Henry Rich and Lee Parsons decided to accompany us back as far as the Kenamu River via the Travespine River, a shorter route back to Henry Rich's cabin. We appreciated this very much, this would save us some time and allow us to see more. Saturday April 1st, 8:30 a.m. we were ready to leave Goose Bay accompanied by Lee Parsons and Henry Rich. It was a cloudy day and shortly after leaving it began to snow. By 10:00 it was snowing very heavily making it impossible for us to follow the tracks that Henry Rich had made the previous week on the Travespine River, this really slowed us down. The snow was also very deep on this river and we were continuously getting stuck. 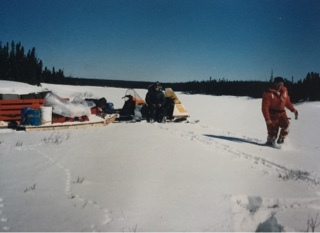 At 2:30 p.m. we arrived at Marshland between Travespine River and Kenamu River, Lee Parsons and Henry Rich were now ready to turn around and head back to Goose Bay. Clayton, Terry and myself continued our way home, hoping to reach Henry Rich's cabin by the end of the day. It was still snowing very heavily at 8:30 p.m. when we arrived at the cabin. The day was a long and hard one and we were now ready to settle down for the night. Sunday April 2nd, there was light snow still falling and approximately 15 inches of new snow had fallen. At 11:00 a.m. we decided to leave even though we were still unable to find the track we had made a few days before. We traveled very slowly today, and after we left Little Drunken River to travel over the hills we worked fairly hard. At 5:30 p.m. we stopped to set-up camp 5 miles beyond Little Drunken River, it was the same place we had camped on the way over. We had now taken 2 days to travel less distance than we had travelled in one day on the way over. We knew that if we were to continue at this rate, it would take us 22 days to get home. Monday April 3rd, we were ready to leave camp at 8:30 that morning, it was a sunny and milder day. We were traveling faster today, by 10:30 a.m. we arrived at Day River. There was a lot less snow in this area so we were able to follow our track that we made on the way over. At 12:00 a.m. we arrived at Clayton's Pond, picked up our gasoline and supplies we left there for our way back. We left Clayton's Pond at 1:30 p.m., today seemed to be the best traveling weather of the entire trip. At 4:30 p.m. we had to stop at Mountie Pond to pick up the rest of our gasoline, and at 6 p.m. we arrived to Francis Pond, where we set-up camp for the night, things were going a whole lot better now, the distance we travelled today had taken us five and a half days on the way over. Tuesday April 4th, it was a cloudy and very mild day. We left Francis Pond at 8:45 a.m., hoping to reach the falls of Little N. W. River by the end of the day. We traveled very slowly through wooded areas, continuously sinking deep in the snow due to very mild weather. At 4:00 p.m. that evening it began to rain, by 6:30 p.m. we stopped for the night, we were now about 8 miles from the falls. Wednesday April 5th, the weather wasn't very nice, it was a misty rainy day. We were ready to leave camp at 8:00 a.m., if everything turns out as planned we should reach home today. We arrived at the falls at 10:00 a.m., and by 11:30 we were at Partridge Gulf, where Garry Lessard has his cabin. We borrowed 10 gallons of gasoline from there, knowing that we would need more gas than usual to get home because of the rain. It was raining heavily now making it very difficult to haul our supplies. We left Partridge Gulch, traveling at a good rate despite the rain. At 7:00 p.m. we arrived in St. Augustine, feeling rather content to finally be home, and having successfully accomplished this snowmobile journey. 1. A longtrack snowmobile would travel faster and easier over deep soft snow compared to an Elan, the smallest snowmobile that Bombardier manufactures. 2. Be sure not to take any unnecessary supplies, such as tools and spare parts, this will make your load heavier and slow you down. It will also make you work harder when you have to go uphill. 3. Four people might make things easier, on many occasions two people could go on and prepare a trail for the following day, while the other two would stay behind and set-up camp for the night. I hope to have the opportunity to make this trip again, to be able to take my wife Eleanor and my son Pete with me so that they could see and enjoy the experience, that they have heard me talk about so often. 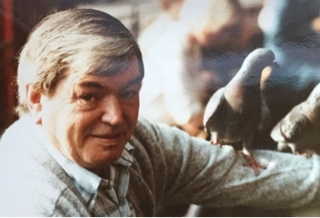 Notes by Marie Smith: it is obvious how much joy Eldon took from this experience. His desire to share the experience with his wife and son are testimony to his love of the adventure. Also, his detailed account of the journey shows his level of interest in the experience. 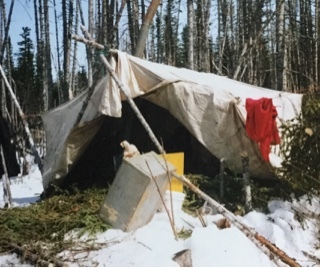 In the struggle against nature in the Québec/Labrador wilderness, Eldon was in his element, using his physical strength and ingenuity to overcome all obstacles. Planning and forethought were essential as well as adapting to conditions that presented themselves. Eldon enjoyed the physical struggle against the elements, immersing himself in the experience. With the snow machines and the availability of the global positioning system, imagine how much easier this journey would be today. Eldon's journey on a small Elan, using charts and compass, was more difficult for certain. He was an interesting man. I wish I had met him. 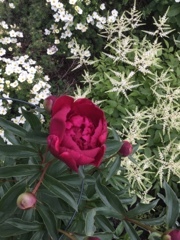 Thank you to Eleanor Bursey Gallant for allowing me to put Eldon's journal on the blog. 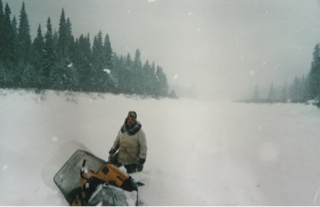 Eldon Gallant, husband of Eleanor Bursey Gallant, wrote this account of his adventure by snowmobile from St. Augustine, Québec to Goose Bay, Labrador and return. 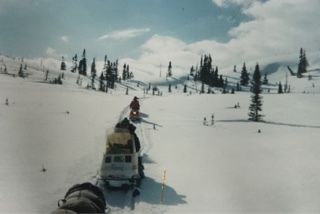 While the Montagnais made this journey on foot, snow machines made the journey possible for more people and Eldon wanted to be the first to accomplish it. This is Eldon's story, in his own words. It is a tribute to his love of the outdoors and though he died six years ago now, his story now has a life of its own. I hope he would be pleased. 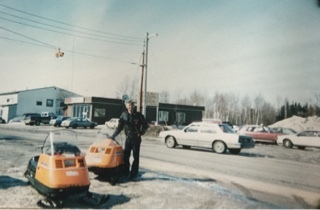 In late February 1989, Terry McKinnon and I decided we would travel by snowmobile from St. Augustine to Goose Bay, Labrador. This journey was never before done by snowmobile. 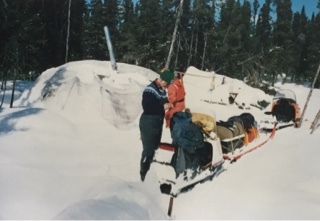 It was estimated to be approximately a 250 mile cross country journey, and we planned to travel over frozen lakes and rivers as much as possible. At that time we did not feel confident enough to attempt this journey on our own, so we began searching for two more people from our village to come along with us. Many of the people we asked would have liked to have made the trip with us, but refused at the time for one reason or another. It was preferable that the person or persons interested would have some experience with the wilderness. We later approached Clayton Pilgrim, an experienced bush pilot, who had flown over this territory many times, we asked him if he would be interested in this snowmobile journey, clayton said yes without even hesitating, he told us that he had thought about making this trip for a long time, but he didn't think he could find anyone that would be silly enough to attempt this trip with him. At this point we decided that we would attempt to make this journey, the three of us, we still hoped to find one more person, but we began preparations for the journey anyway. The first step in preparing for this trip was to gather land charts containing as much detail as possible so it would make it easier for us to study them and decide our route before leaving. After making the study of the charts we realized that there would be two areas of our journey that would be tough for us so we felt that we would need more information on these areas. 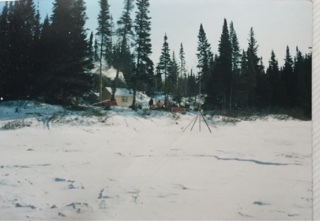 The first area was a section between the mouth of Little North West River and Francis Pond, which was approximately 30 miles, this section had one fall in the river and we knew we would have to travel over land with very few points such as ponds and rivers to identify ourselves with the charts. We received information from Douglas Fequet on this section knowing that he was very familiar with the area, Douglas told us that himself and Kenneth Maurice had planned a trip to this area and that they would accompany us from Partridge Gulch to Francis Pond, we took him up on the offer knowing that it would be of great help to us. 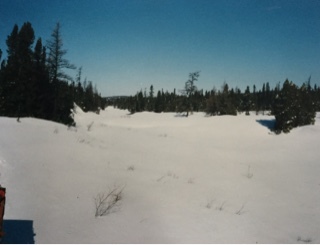 The second area that we were concerned about was the Kenamu River, which was our route through the Mealy Mountains to Lake Melville, the charts indicated that there were a lot of rapids on this river, Lee Parsons, a resident of Goose Bay, referred us to Horst Goudie, a trapper, who had trapped this river for 50 years. Mr. Goudie told us that we would probably pick up his trail on the river, and if we did we were to be careful, because on occasion he had to change parts of his trail due to ice breaking away in the rapids, he did assure us that the water was not deep in these rapids but we would have to be careful not to get ourselves or our equipment wet. In further preparation for our trip we discovered that with the food and supplies that we had to carry, we would not be able to carry enough gasoline with us to last the entire trip, Clayton and I then decided that we would carry 100 gallons of gasoline that was donated by Garage Gallant, into Clayton's Ponds and Mountie Pond. We estimated this to be our halfway point. While flying we would also have the opportunity to observe the route that we planned to take. We were now ready to gather the supplies that we would need in order to complete this journey, listed here are the supplies needed: Gasoline, charts, compass, rackets, axes, tent, stove, first-aid kit, food, rain clothes, waterproof matches, rope, sleeping bags, cooking gear, ice fishing gear, gun and snowmobile parts, the Hudson Bay Company donated $150.00 worth of food for this trip, and Garage Gallant provided us with spare parts for our snowmobiles. Sunday March 19th, 1989 we were finally all prepared to leave. We departed from St. Augustine at 3:00 p.m., and arrived to Partridge Gulch at 7:50 p.m., Douglas Fequet and Kenneth Maurice were waiting there to accompany us as far as Francis Pond. We spent the first night at Garry Lessard's cabin. Monday March 20th at 8:30 a.m. We left Garry Lessard's cabin and started towards Abraham Lessard's cabin, which was situated below the falls in North West River. It was a sunny but cold day, and after arriving to Abraham Lessard's cabin we spent the entire day getting our snowmobiles and supplies up over the falls. Feeling rather exhausted we then returned to Garry Lessard's cabin to spend another night. We arrived back to the cabin at 6:30 p.m.
Tuesday March 21st we left the cabin at 9:15 a.m., it was a sunny but extremely cold day. At 10:15 a.m. we were back to where we had left our supplies the previous day. We began to portage our way up hill with our supplies. We worked until 5:00 p.m. and only managed to gain 10 miles. The weather had changed in the afternoon, it became milder and there were a few snow flurries. We set up camp for the night in a wooded area, unable to identify exactly where we were on the chart. Wednesday March 22nd 8:00 a.m., leaving behind our supplies we went in search of a good trail to Francis Pond. There were snow flurries and the snow was very deep, making it difficult for us, and as I mentioned earlier it was a heavily wooded area. At 11:00 a.m. without succeeding to find a good trail we returned to the campsite. 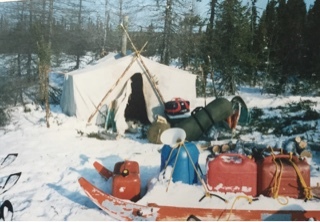 The same day Douglas Fequet, Kenneth Maurice and Clayton Pilgrim left the campsite at 1:00 p.m. to try again, by this time the snow was really coming down. They returned at 3:00 p.m. with good news, they had found a good trail. Thursday March 23rd, it was another, cold but sunny day, it was to be our last stretch to Francis Pond. With supplies packed we were ready to leave at 9:15 a.m. We arrived to Francis Pond, where we had lunch at 12:00 p.m. After having lunch, it was now 1:45 p.m. and Douglas and Kenneth were now ready to go back and we were ready to continue our journey. At 3:15 we arrived at Mountie Pond, picked up some gasoline and left at 4:00 p.m. We ran into an obstacle, there was a falls in the brook that we were traveling on. It was decided that we would set up camp and conquer this problem in the morning. Friday March 24th, we got on the go very early because we had to cut a portage over the falls. The weather was much the same as Thursday, fairly cold but sunny. At 9:15 a.m. we had the portage cut, gathered supplies, and we were now ready to leave. Traveling through woods, marshes and small ponds, we cross two Indian portages, and we had to cut two portages. By 5:00 p.m. we were ready to set up camp on a small pond, which we decided to call Terry's Pond. We covered about 10 miles today. 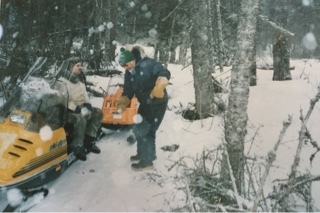 There were times today when we had to beat trail by foot with snowshoes, the snow was too deep for our snowmobiles. Saturday March 25th it was sunny and milder than the previous days. At 8:30 a.m. our supplies were gathered and we were ready to leave. We stopped around 11:00 a.m. to repair the handlebars on Terry's snowmobile and the springs on Clayton's snowmobile. It was approximately an hour delay. It had started to snow around 11:00 a.m., so there were times the snow was very deep. We arrived at Ronald's Pond at 4:30 p.m. and decided to leave some supplies there in order to get to Clayton's Pond before dark. At 6:45 p.m. We were at Clayton's Pond, there was some shoveling to be done. 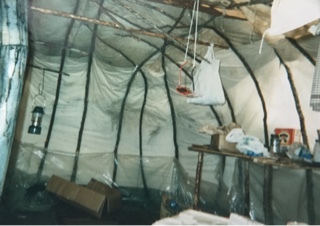 The tent was covered with snow and ice, and the roof looked like it was about to cave in, this tent belonged to Jerome Mestenapeo, he had hunted around this area the previous fall, we spent the night there. Sunday March 26th, Easter Sunday, it was mild and sunny, but there were snow flurries throughout the day. Terry and I returned to Ronald's Pond to pick up the supplies we left behind the day before. Clayton stayed back to cook our Easter dinner, which was bologna. In the afternoon the three of us went searching for a good trail from Clayton's Pond to Little Drunken River. We found a good trail, returned to camp early and relaxed the rest of the day knowing that we were about halfway and the trail for the next few days would be fairly easy. Monday March 27th, it was again mild and sunny and light snow flurries late that evening. At 8:30 a.m. we left with all of our supplies, and traveled on Joir River to a small stream which brought us to Marshland. We had to use a compass to travel this Marshland, it was difficult for us to identify our position with land charts because the small ponds indicated on the charts did not show up. Everything looks alike when it is covered with snow. At 6:45 p.m. we set up camp for the night on a small pond with very few trees to shelter us. We were unable to positively identify our location on the chart. Tuesday March 28th, a cloudy day with strong northerly winds. At 8:30 again this morning we were on our way, at 1:30 p.m. we reached a small round pond, this was headwaters of Little Drunken River, it was all down from this point on. We stopped to change a boogie wheel spring on my snowmobile, and at 5:30 we stopped again to set up camp for the night. The campsite was approximately 5 miles from Little Drunken River. By this time the weather had cleared but it was getting colder, the area which we had traveled the past few days showed no indication of anyone ever passing there before. Wednesday March 29th it was sunny but very cold, this was to be the coldest morning of the trip. We left the cabin at 8:30 with all supplies and arrived at Little Drunken River at 10:00 a.m. We followed the river as much as possible but by times we had to drive over hills because the river was too rough. We found some tracks shortly after we got on the River but were unable to follow them because they were covered by snow in places but it was still of some help to us. At 1:30 p.m. we arrived at Henry Rich's cabin, situated at the mouth of Little Drunken River. We left the cabin at 2:00 p.m. to take the Kenamu River tracks which were also difficult to follow for the snow had covered them. We traveled very slow because we were not sure of ourselves and we didn't want to get into trouble. At 7:10 p.m. we arrived at Lake Melville feeling good about being so close to our destination. By this time the weather was getting extremely cold, with strong northerly winds. We arrived in Goose Bay 8:20 p.m., we felt very happy to have completed the trip, Clayton had his face badly frozen, and the temperature in Goose Bay at that time was -38 Celsius. Born in Hamilton, Ontario, Canada in 1949, he had a heritage that extended back to Prince Edward Island. This man, Eldon Gallant, was the oldest child of Edmund and Rita Arsenault Gallant, both of the Wellington area of Prince Edward Island. 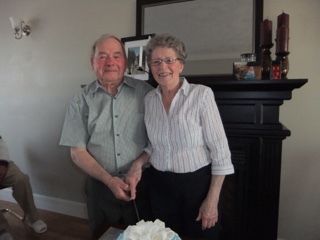 Rita and Edmund married on PEI and moved to Ontario for work. Edmund had a job digging trenches and laying pipe. 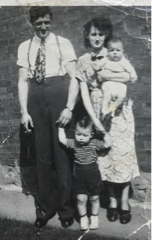 He and Rita had two boys and Rita was pregnant with their third child when Edmund was killed in an industrial accident. A trench collapsed on him, killing him. 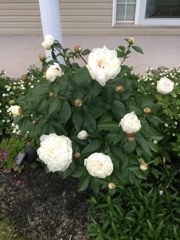 Rita returned to PEI to bury Edmund and stayed home to be near family. She delivered a third son shortly afterwards. 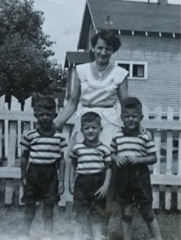 Rita lived in Summerside with her three boys, Eldon, Ron and Paul, supporting them by running a boarding house. She eventually met Alphonse Gallant, no relation to her first husband, and they married when Eldon was seven. Rita and Alphonse had eight children together. Rita was a hard working woman, an excellent cook, who even cooked for the Queen and Prince Charles during their visits to the island. She had a green thumb and kept a lovely garden, could sew anything and did a great deal of volunteer work. Of course, Rita raised eleven children so she was busy enough as it was. Eldon became a truck driver, and went to work in Ontario where he met Eleanor Bursey who was from St. Augustine, on the Lower North Shore of Quebec. 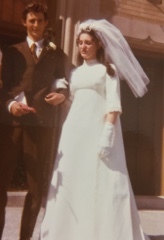 They married in 1970 and in 1974, moved to St Augustine to care for Jack Bursey, Eleanor's father, after her mother, Julie died. 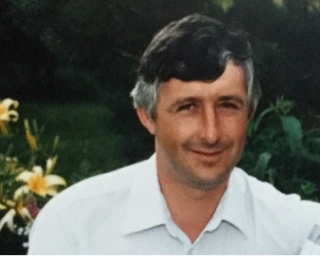 There Eldon worked as a fisheries' officer for four years. 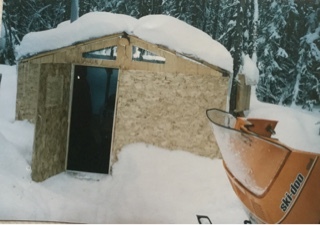 Then he opened a garage where he sold and repaired Bombardier snowmobiles. Life on the Lower North Shore was paradise for Eldon. He loved the outdoors and St. Augustine was a man's world to him. The cod jigging, trout and fly fishing, hunting, trapping, and snowmobiling were all ventures which Eldon enjoyed. 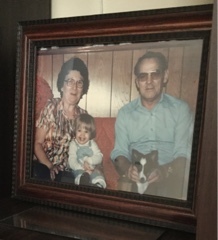 In 1985, Eldon and Eleanor adopted their son, Peter. The boy was a joy to Eldon, who loved children. He was eager to share his love of the outdoors with Pete, who was not as keen on the experiences as his father. Still, they shared many camping trips with one of Pete's cousins as company for his son. 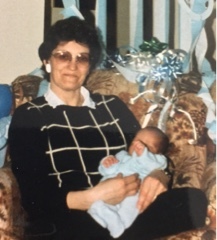 Then the family moved to Prince Edward Island with Rita who needed some assistance in her home at this point in her life. Eldon died in 2009, Rita died this past year. Pete lives in PEI and has two children here. Eleanor is a family friend who shared her story a few weeks ago. 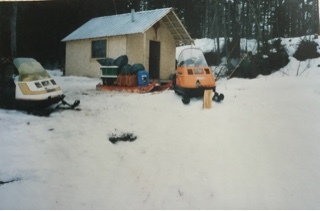 Part 2 of Eldon's story will be his journal account of the return snowmobile trip he took with some companions from St. Augustine to Goose Bay, 1989. Thank you to Eleanor Bursey Gallant for sharing Eldon's story. In the Smith family, Bessie and Ern Smith, my husband's grandparents, had two boys and five girls. Rick's father was the second son, Melvin. 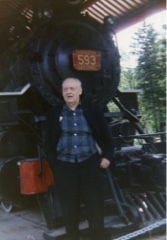 The oldest child in the family was Fred, born in 1926. Fred worked as a cook but in his mid-teens he delivered telegrams around Corner Brook, Newfoundland. He did this job during the second world war, making his way through Corner Brook during black-outs. On one occasion, he brought a telegram to the armoury near Jubilee playing field. When he went inside the armoury, Fred was shocked to see men, wet, covered in blankets, sat around the perimeter of the building. Military personnel guarded them. The person in charge said to Fred, "You didn't see anything here." Later that night, Fred confided in his father because he knew he could trust Ern. His father told him, "Don't say a word about this anywhere, my son. You'll be in a lot of trouble if you do." 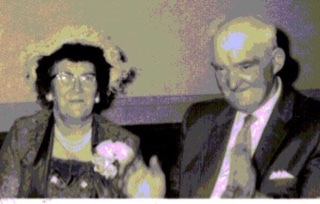 Fred did not tell his mother either because Bessie would have it on jam crocks, as the old Newfoundland saying goes. She loved to have a story to tell that put her in the limelight. Years later, Ern told his youngest daughter, Marie, of Fred's experience at the armoury. What became of those men Fred thought to be prisoners? There is another part to Fred's story involving the war as well. In the early morning hours of October 14, 1942, a Newfoundland passenger ferry, the Caribou, was sunk by German submarine, U-69, as the ferry crossed the Gulf of St. Lawrence back to Port aux Basques. One hundred and thirty-six people died, many of them women and children. It took many hours for this news to reach ordinary Newfoundlanders. 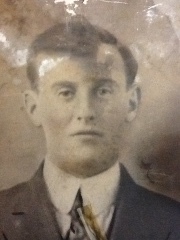 Later that day, young Fred Smith delivered telegrams around Corner Brook reporting the news of the sinking of the Caribou and the many deaths. Again, he told Ern when he arrived home that evening. Ern commented, "I knew something was wrong when the train didn't come through as usual." Every morning, the train left Port aux Basques after the ferry docked to deliver the passengers to their various hometowns around the island. The morning of October 14, the train did not leave Port aux Basques. The Caribou was one of many vessels sunk in Newfoundland waters and in the Gulf of St. Lawrence during the second world war. Fred's information about the "prisoners" highlights how dangerous it really was for Newfoundland during that period in history. Newfoundland would have been a foothold in North America for the Germans, a gateway to Canada and beyond if the fortunes of that war had not turned against them. Fred was a witness to that history. The day started well. Melvin and Sylvia Smith took their Volkswagen Rabbit to the dealership to be repaired. They dropped off the car and returned home in their Chevy truck. Melvin always wanted a truck. They purchased it during a visit to Ontario the previous month because it was so practical for their trips to the cabin at Cartyville, Newfoundland. The Smiths drove back to the dealership in the afternoon to get Sylvia's car and Melvin waited to see that everything was alright with the vehicle. They were headed down O'Connell Drive towards home, with Sylvia in the lead, when it happened. As they passed the college, Melvin, distracted, took his eyes from the road as Sylvia braked for an animal. BANG. Melvin, in the new truck, ran into the back of Sylvia's Rabbit. Nobody was hurt but both vehicles were damaged. A police officer responded to the call. Arriving on the scene and assessing the situation, he said to Melvin, "I should give you a ticket, but I think you have enough problems." The things people do to save a dollar! The roll call has begun. Rick, my husband, and I, notice that when either of us talks to one of our granddaughters, we may go through the roll call. For example, if Rick is talking to Caitlin, he might say, "Claire, Sylvie, Caitlin." We do not blurt out the list of females in the family but stumble through them because the correct name escapes us. Does this phenomenon come with age? My grandfather O'Brien did the roll call as well. If he was talking to me, he said, "Monnie, Mary, Esther, Marie," the last name always the one to whom he was speaking. Granda did not always do the roll call however. It happened as he aged, in the last years before he died at the age of seventy-two. His mind was sharp but the name retrieval was not. I came to expect the litany during conversations, knowing that he would arrive at my name as he always did. Nan was different though. She did not do the roll call. The names disappeared from her mind over time. Nan lived to be eighty-six and suffered from vascular dementia. She lost all memory, not just names. Her family experienced the long sad goodbye. So, it sounds like the roll call stage has arrived for us . We may as well enjoy this stage too. We cannot change it, but we can laugh and remember with a smile those special people who have gone before us. 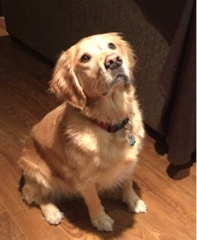 Georgie, the granddog, is visiting again for a few weeks so it is time for some dog stories. 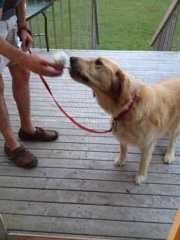 This golden retriever loves ice cream. Once a week we take her for ice cream when she's here. Georgie recognizes the street where the dairy bar is located as soon as we turn on to that road. Then she starts to whine and drool, knowing what is coming. During a visit to her home one day last summer, we had ice cream, as did Georgie. While our daughter, Claire, tended to one of the girls, she placed her ice cream cone on the kitchen counter. After Claire turned her back, Georgie jumped up over the counter, reached in and chomped on the cone, devouring it in two bites. She had not done anything like that before but let's face it, the dog loves her ice cream and you cannot turn your back on her when it is around. More care is taken with ice cream placement since that time. There was another dog in the family who was a food thief as well. 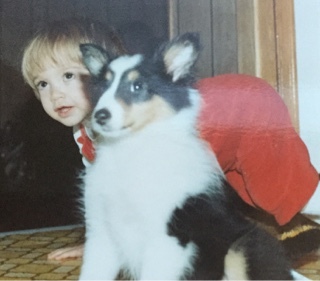 My brother had a dog called Morgan, a Shetland sheepdog. Frank's then girlfriend, now wife, Michele had baked a chocolate cake for an anniversary, an open book shape on which she would put the names of the couple. She left the cake on the dining room table overnight, ready to decorate in the morning. The next morning, my mother discovered that one side of the cake was missing, looking as if it had been cut from the remaining half. When my brother woke, Mom said, " That's pretty good what you did. You must have been some hungry." Frank replied, "What are ya talkin' about, Mudder?" "You b'y. You ate half the cake Michele had ready to decorate for the anniversary," said Mom. "I didn't touch that cake, Mudder. I didn't even see the cake. Where is it?" Mom showed Frank the cake and seeing the damage, Frank said, "Morgan." Morgan was quiet that day, sheepish, or should I say dogish, from eating the cake, or sick from the chocolate, we never knew which. Michele made and decorated a second cake, out of Morgan's reach this time. A friend gave my brother, Frank Pretty, an article from the Daily News of St. John's, Newfoundland, dated August 14, 1919. 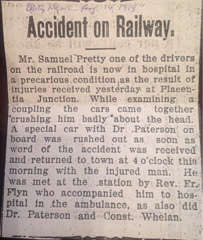 It provides some interesting information about an accident my grandfather had on the railway line at Placentia Junction on the previous day. Mr. Samuel Pretty one of the drivers on the railroad is now in hospital in precarious condition, as the result of injuries received yesterday at Placentia Junction. While examining a coupling the cars came together crushing him badly about the head. A special car with Dr. Paterson on board was rushed out as soon as word of the accident was received and returned to town at 4 o'clock this morning with the injured man. He was met at the station by Rev. Fr. Flyn who accompanied him to hospital in the ambulance, as also did Dr. Paterson and Const. Whelan. There is much to be learned from this article and much that can be put together from what we know of my grandfather's life at this time. First of all, there must have been a protocol to follow when a worker was injured on the job at the Newfoundland Railway. Phones were in use on the island at that time but did Placentia Junction have a phone connection to St. John's or did they send a telegram to St. John's to report the accident? The railway sent a "special car" which "rushed out" with a doctor on board to retrieve the injured man. This car must have been equipped with medical supplies for emergencies. But the "rushing" has to be taken in context of the nickname of the railway, the Newfie Bullet, because it was so slow. It was the fastest way to get to our grandfather at that time, but if his injuries were serious, he would have been long dead by the time help arrived from St. John's one hundred kilometers away. It also says of Samuel Pretty, that "cars came together crushing him badly about the head." It is portrayed as a serious accident involving a head injury. How could Sam have survived it? The priest and the constable met my grandfather, Pop, at the station. Pop Pretty had been married in the Roman Catholic Church but he was baptized in the Church of England. His parents died when he was young and he moved to St. John's to work in his mid teens. He may not have been practising his religion so joined his wife, Ida Stewart, in the Catholic Church when they married. The priest came because the injury might have been serious and to give Pop the last rites, called Extreme Unction at that time, if necessary. Knowing my grandfather and his lack of religious conviction in his later life, I wonder what he thought of this development, or if he was in fact conscious? Did his family ask the priest to attend to him? They lived in the shadow of St. Patrick's Church. Did Pop think that he was dying or was all of this routine procedure for a work injury on the railway? The presence of the Constable gives the impression that an injury on the job required an investigation by the Newfoundland Constabulary. Foul play would have to be ruled out as the reason for the injury. At this time in his life, my grandfather was married to Ida Stewart, and they lived on the west end of Water Street with her parents, Tom and Mary Walsh Stewart, across from the train station. Had his family been notified about the accident? If they didn't have a phone at that time, they may have been notified because of their proximity to the station. 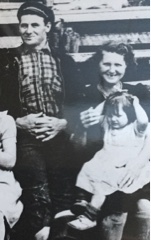 By August 1919, Sam and Ida had two children, Muriel, born May 1918 and Albert, born June, 1919. Was Ida able to leave her two babies with her mother to meet Sam at the train station or at the hospital at four in the morning? Maybe her father, Tom, met him and went to the hospital to be with Sam. What was Ida thinking at this time? She must have had anxious hours waiting to find out how serious this accident was and to what extent her husband was injured. She could be left a widow with two babies. There was no welfare cheque as a social safety net at that time such as we have today. What would she do? The Stewart woman worked before they married, but Ida had two babies now. Would her parents help her? How long was my grandfather off the job? Did he have an income from the railway during that time? How did they manage? When he went back to work, was Pop nervous doing the same task again? Did he have a new appreciation for life? If my grandfather had died from this injury, the remaining five children would never have been born, Tom, Marg, Angela, Sam and Robert. There are three generations of Pretty descendants alive today because Pop Pretty survived that injury. Placentia Junction is where my brother, Frank, and his wife, Michele, own a cabin which was owned by Michele's parents. Many railroad personnel owned cabins in the Junction area years ago. One such worker was Jack Taylor, Michele's father. 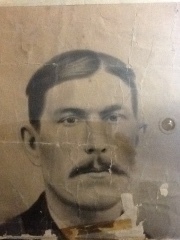 Another was my father's older brother, Tom. Long before there was a road into Placentia Junction, people travelled to their cabins at the Junction by train. It would be interesting to know where the accident occurred there. Finally, it is interesting to see the use of punctuation in the Daily News in 1919; few commas were used in the story. The term Rev. Fr. to refer to the priest is not in common usage today either. Was the priest's name Flynn and not Flyn? Also the phrase "precarious condition" has been replaced today with standard terms such as critical, serious, or stable, depending on information released by the hospital. It is too bad such was not the case almost one hundred years ago because we would have a better idea of how bad Pop's injury was. From what his family saw of his life, he made a full recovery. Thank you to Tom McGrath for the copy of the article. Note: neither Albert nor Robert Pretty survived childhood. When it comes to clichés, I take the cookie. If these walls could sing, they would confirm it. I should avoid them like the flu but I just don't learn it. Maybe I do think outside the carton because I mix them up. But every cloud has a silver side because I try not to use them in my writing as a result. Only time will indicate if I have been successful. Yesterday, my husband, Rick and I spoke about the reward money offered by the potato industry of Prince Edward Island. Someone or some group of people put metal in potatoes which made it to the market place. Of course the farmers are scared out of their senses because they do not want to lose their markets due to this tampering. The reward is now $500,000.00 and the hope is that good information comes to those who wait. My comment was, "If I knew who it was I would sing like a parrot." "You wouldn't say much then because parrots aren't known for singing," said Rick. At the beginning of the day, another one bites the asphalt! 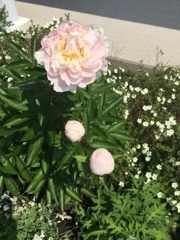 They are fleeting moments in time every summer, these few days when the peonies are in bloom. Though we think of her often, my husband's grandmother, Classie, is foremost in our minds during this time. 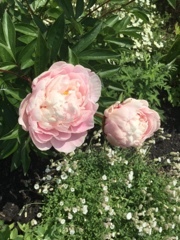 Classie Lawrence Mercer grew the most beautiful peony plants and she shared them with family and friends. 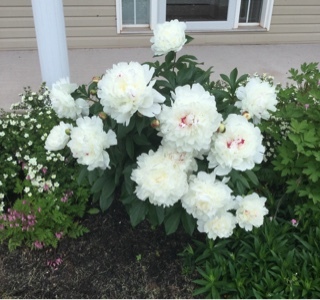 We had to leave our plants in Grand Falls-Windsor, Newfoundland, when we moved to Prince Edward Island, but our first garden purchase for this house was a variety of peonies, in memory of Classie. The garden colour this time of year is spectacular, calm or vibrant, depending on what you see. Today is Classie Time however. 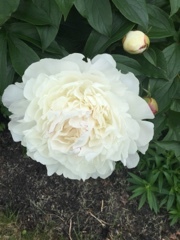 Enjoy the peonies. 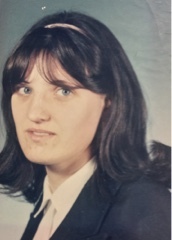 The eleventh child born to Jack and Julie Bursey of St. Augustine, Québec, Eleanor was born in 1948. Three of her siblings had died prior to her birth. The first eighteen months of her life were uneventful, with life in St. Augustine going along as usual. The older children helped look after her, and she had ready playmates in the younger ones. As the youngest child in the house, Eleanor slept in a crib in her parents room on the main floor of the house. St. Augustine had a Roman Catholic priest named Father Langois. Every year he brought boxes of toys and clothes into the community. The items came from the United states, in tea boxes, which were lined with foil. 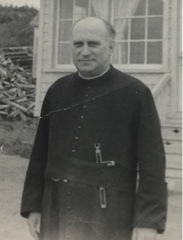 Father Langois sold the items to the people in the community. So in the late fall of 1949, Eleanor's parents bought clothes and toys from the priest for Christmas. Everything was fine until the end of December. When her sister, Hampton, tried to get Eleanor out of her crib, Eleanor could not stand. The family sent for Mrs. Clench, a trained nurse, who lived in the community. "I hope to God it is not what I think it is," said Mrs. Clench. She suspected polio. Mrs. Clench sent a telegram to Montreal and the next a day, an air ambulance flight landed on the frozen river. The men cleaned off the ice and outlined the runway with burning pots of oil. By this time, nine children were affected, two eventually died. The people suspected the polio virus came to the community in the boxes of toys and clothes. The village was quarantined, the only place on the coast with polio. The children were taken to Hôpital Pasteur in Montreal. While Eleanor's family was English speaking, in Montreal, Eleanor heard French. When she finally arrived home for an extended time five years later, Eleanor spoke French. Those years away from her family are lost to Eleanor, who has no memory of that time. It may be a good thing. 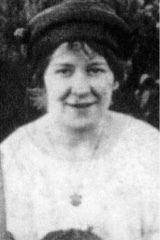 However, there were other children from her community with her at the hospital so Eleanor still had a connection to home. Imagine what it must have been like for her parents, not knowing what was going on day to day with their young child. Visiting Montreal was out of the question. Even when she did return home, Eleanor went back to Montreal for yearly check-ups. She also had a further period of thirteen months away from home, living in foster care this time, as doctors operated on her left leg, trying to improve her mobility. This surgery was unsuccessful and foster care was not a pleasant experience for Eleanor either. Through it all, Eleanor had to wear braces of varying sizes, starting with a brace on her left leg from her foot to her hip, Over the years, doctors reduced the size of the brace. Eleanor eventually wore a high boot. Young people of St. Augustine had to leave the community to attend high school. 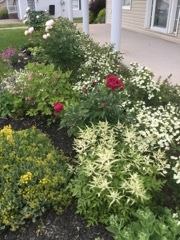 They went to Cross Point in Restigouche, Québec. By this time, Eleanor was accustomed to being away from home, so the transition for her was not as difficult as it was for some of the young people. By 1968, Eleanor was living in Ontario and working at Eaton's Department Store. Later she worked as a filing clerk at Princess Margaret Hospital. About this time, she met Eldon Gallant, a trucker from Prince Edward Island. They married in 1970. Then in 1974, after her mother died, the Gallants moved to St. Augustine to look after Eleanor's father. 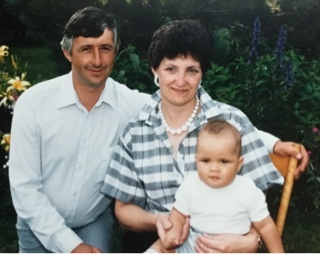 One of the highlights of Eleanor's life, was the day she and Eldon adopted their son, Peter in 1985. The family lived in St. Augustine until 1997 when they moved to Prince Edward Island to look after Eldon's mother. Sadly, Eldon died in 2009. 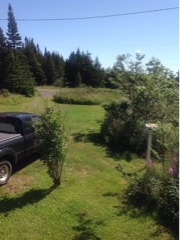 Eleanor still resides in Prince Edward Island and enjoys a busy life with friends and family. She has two beautiful grandchildren as well, who fill her life with great joy. It is interesting that the young child who spent so many of her formative years in hospital away from home, grew up to provide care for other people. The care she received had a huge impact on that little child as did the wonderful parents who gave birth to her. She became a loving, caring, adaptable, friendly woman. Polio affected Eleanor's mobility, but she does not have any pain in the affected leg. She can do anything she needs or wants to do. 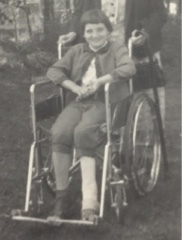 Eleanor's brush with polio does not define who she is. Rather, it informed her life, in combination with her heritage and her community. It all started with Reuben's journey to the coast, all those years ago. Thank you to Eleanor Bursey Gallant for sharing her family story this week.